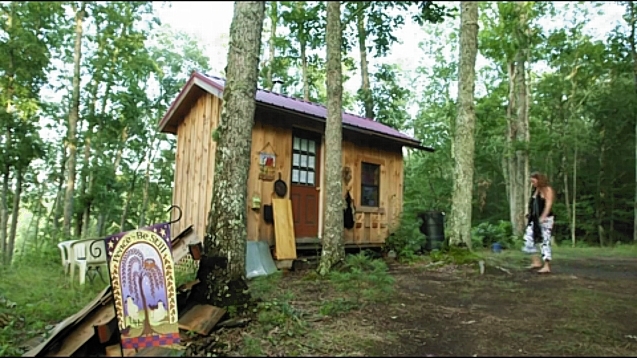 Jennifer Wood’s cabin in Greenbank, West Virginia. “Search for a Golden Cage” is the latest documentary film to capture the challenging reality of living with electromagnetic hypersensitivity (EHS). In this well-produced, 12-minute documentary, photographer and filmmaker Nadav Neuhaus introduces us to three unrelated people with EHS – each struggling to find a safe haven in our increasingly electrified world. Electrosensitive people can experience extreme pain and illness from exposure to wireless devices such as cell phones, cordless phones, smart meters, wi-fi, as well as other everyday sources of electromagnetic radiation. “I’ve had to give up every single thing in my life because of this illness,” says Jennifer Wood. 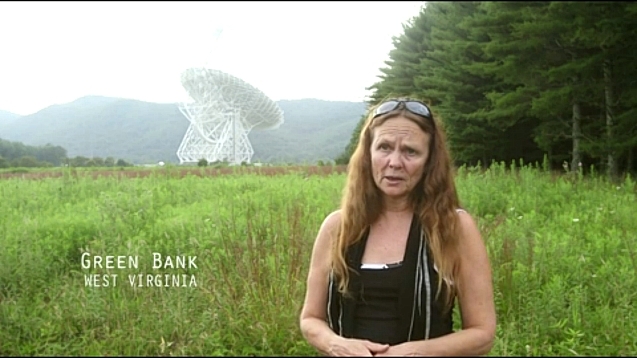 The film opens with architect Jennifer Wood, who now lives in a tiny cabin she built in the mountains of Greenbank, West Virginia. The small community of Greenbank has, in recent years, become famous as a safe haven for so-called “WiFi Refugees” – people who cannot tolerate wireless radiation. Greenbank houses the National Radio Astronomy Observatory, which makes it part of the US Radio Quiet Zone, so that the radio telescopes can monitor sounds from outer space without interference. Jennifer first became electrosensitive in 1996. At her worst, she weighed a mere 77 pounds and was near death. She now lives without electricity or running water. We watch her heat her kettle on her woodstove. “I’ve had to give up every single thing in my life because of this illness,” Jennifer says. “I didn’t do it because I wanted a natural lifestyle. I did it to survive… More and more people are getting extremely ill from this and are being displaced from their homes,” she adds. “They are calling us ‘WiFi Refugees'”. Dafna Tachover visits 60 rural homes and finds only one where she can live without pain from wireless radiation. Next we drop in to the life of lawyer Dafna Tachover as she searches for a safe place to live in the rural countryside of upstate New York. Dafna researched 500 possible homes, and physically visited 60 of them with her radio frequency meter in hand. Out of all that searching, she found only one house she could tolerate. Dafna’s electrosensitivity cost her everything – her marriage, her ability to work. At one point she found herself sleeping in her car for seven months. Musician Andrew McAfee sleeps in an underground bunker to shield himself from wireless radiation each night. Professional musician Andrew McAfee had to go underground to reduce his exposure and get a decent night’s sleep. He built a subterranean concrete bunker beneath his home in Raleigh, North Carolina, and that’s where he sleeps most nights. Dr. Carpenter estimates that 2-3 per cent of the population now suffers from electrosensitivity. Some experts put the figure higher still. And of course, there are many ill people who have not yet identified the cause of their malaise as being wireless radiation and other forms of electromagnetic radiation. Most people with EHS go for months or even years before accurately diagnosing the cause of their problem. The film closes with Dafna telling us that, after one year in her rustic radiation-free home, the biggest change in her life is that she now smiles again. This entry was posted in EHS, Film & Video and tagged Andrew McAfee, Dafna Tachover, David O Carpenter, Greenbank West Virginia, Jennifer Wood, Nadav Neuhaus, Raleigh North Carolina, University of Albany on May 11, 2014 by Kim Goldberg.